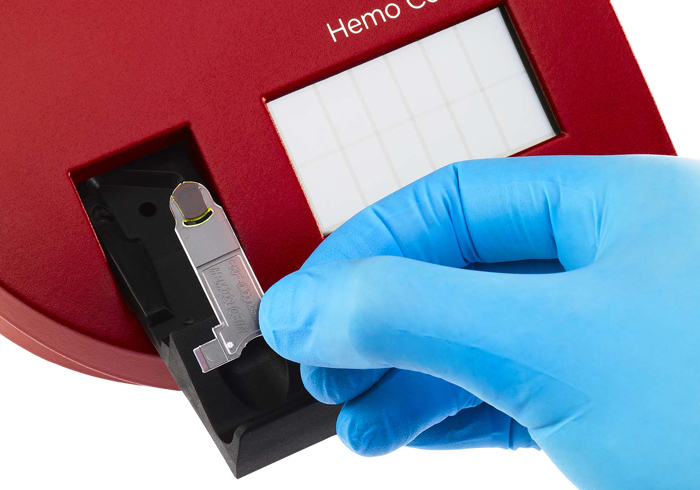 The HemoPoint® H2 Hemoglobin Meter provides a precise hemoglobin and hematocrit* measurement in just 30 seconds – One test. Two results. 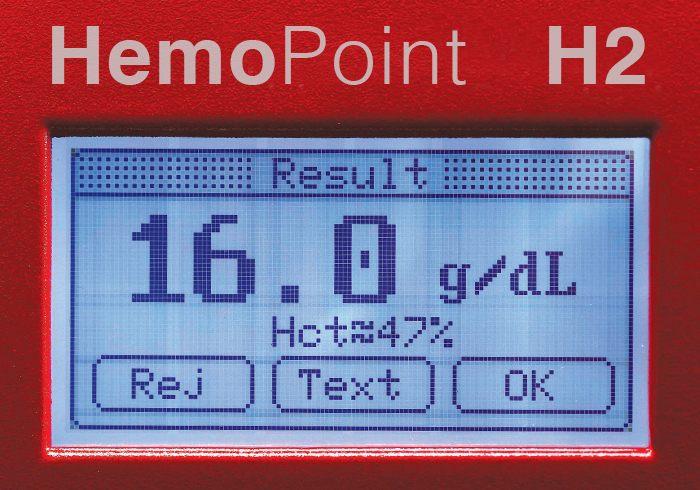 The HemoPoint® H2 Hemoglobin Analyzer provides a hemoglobin measurement and a hematocrit calculation* from 25 seconds. HemoPoint H2 Hemoglobin Meter is CLIA waived and enables users to perform tests quickly and easily. 2. Put microcuvette into analyzer. 3. Result appears in 25-60 sec. The innovative ‘soft load’ cuvette holder prevents optics contamination, reducing the need for cleaning, and the intuitive backlit touchscreen allows simple and easy operation. The large memory of the Hemoglobin Meter allows you to recall the last 4,000 results, including the time and date of result and patient type. This highly portable analyzer also features an integrated rechargeable battery that provides 100 hours use for each charge, allowing the analyzer to be used in the field for large scale screening programs. A handy ‘always ready’ stand-by function reduces energy consumption and allows users to quickly start running tests without needing to remember to switch it on and off. What is the reference method? The HemoPoint® H2 Hemoglobin Meter is calibrated against the cyanmethemoglobin reference method, known as NCCLS (now CLSI) reference method and yields results comparable with ICSH standards. What is the accuracy and precision of the HemoPoint® H2 Hemoglobin Meter? The analyzer is accurate to +/- 0.3 g/dL at about 14.0 g/dL. HemoPoint® H2 guarantees a CV of <1.5%. How long will the analyzer operate on a fully charged battery? A fully charged battery will allow 100 hours continuous operation. On a full charge the analyzer can also sit in stand-by mode for up to 30 days. What control features are available with the HemoPoint® H2 Hemoglobin Meter? Each time the device is turned on a self test is performed automatically. A control cuvette is included as a physical standard to check the optical unit of the device. Liquid quality controls (Hgb Controls) are available for HemoPoint® H2 Hemoglobin Meter. Please ask your local sales representative. What is the impact of air bubbles on the measured result? Air bubbles can affect the measured result. We recommend that if an air bubble is present the cuvette should be disposed of. 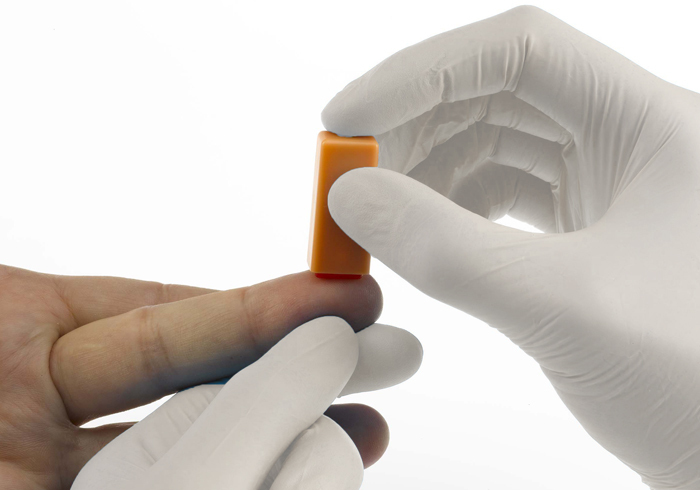 The rounded tip of HemoPoint® H2 Hemoglobin Meter n.x.t cuvettes allows holding of the cuvette in any angle to the sample. An air vent (opening) at the rear of the sample cavity reduces the risk of introducing air bubbles nearly to zero.